When creating new staff in PowerSchool you are required to assign an ID number. The included replacement page will auto assign a number based ID. The page uses SQL to determine what the next valid id number should be. These set of custom pages allow user to quickly create dashboard items by simply entering sql statements using the PowerSchool web interface. You can create 4 types of Portlet’s; Chart, Lists, Validate and External. There are 5 premade portlets you can import to play with and customize. Add the following code to the wildcards\admin_nav_menu_left_css.txt file where you would like the link to show. Copy Calendar allows you to copy the calendar to your currently selected school from another of your choosing. v2a 7/10/2012 Fixed missing code that cause changes not be saved. This customizations adds a few small but beneficial features to the Fees Transactions pages. Adds the viewing of past year fees. Adds the viewing of past schools fees. "SOY Balance" records no longer show. Giving a accurate picture of the fees. I typically run the beta track of FireFox on my Mac. While working on Power Data Solutions Locker Management customization I noticed that FireFox 14 (currently in beta) and PowerSchool versions prior to 7.2 experience a specific jQuery issue. Functions that use jQuery Ajax don't work correctly. Examples of this function are Change School, Daily Bulletin modal popup and other Ajax related functions. This customization adds the ability to enroll students in the dependent sections for a section when adding a course.section to a group of students using the Schedule Mass Enroll function in PowerScheduler. 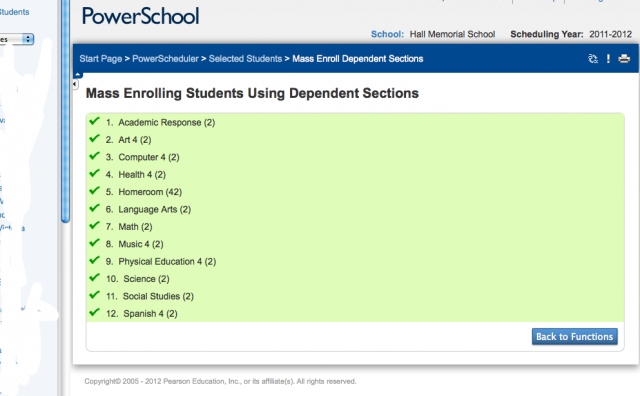 In order to enroll students in the dependent sections with the Schedule Mass Enroll page you will need to use the course.section option on the page. To help find this information a search box has been added. Entering part of a Course Name, Teacher Name or even Course Number will find the available sections and automatically fill in the course.section field. Update: 7.2.0.1 has been released to resolve the issue seen in 7.2. If you are using 7.2.0.0 you should upgrade immediately. PowerSchool 7.2 has been pulled due to a issue with importing data that is stored in the CLOB field type. If you are using PS 7.2 on your production server DO NOT use AutoComm, Quick Import or Import using Template.